Is this a window into the interior of the Moon, and an entrance to a potential future lunar habitat? 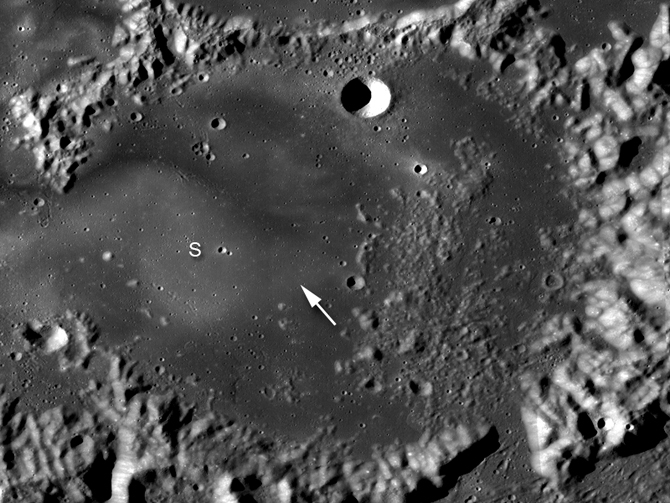 The Lunar Reconnaissance Orbiter Camera has taken a closer look at what is thought to be a skylight into a lava tube in the Mare Ingenii (The Sea of Cleverness) region, one of the few lunar mare features on the far side of the Moon. This skylight is huge — about 130 meters (427 feet) in diameter — and is probably the result of a partially collapsed lava tube. But lunar geologists really weren’t expecting to see this kind unusual feature in this region. Previously, a skylight, or open pit was found in the Marius Hills region in the Ocean of Storms on the near side which is filled with volcanic domes and rilles where a lava tube might form. However, those kinds of volcanic features are not found in Mare Ingenii. LRO will definitely be taking additional looks at this pit. The Japanese SELENE/Kaguya spacecraft first discovered this irregularly-shaped hole, visible in the top image at LROC’s 0.55 m/pixel resolution. The boulders and debris resting on the floor of the pit are partially illuminated (left side of the pit) and probably originated at the surface, falling through the pit opening during collapse. This could be an important find for several reasons. Lava tubes are important in understanding how lava was transported on the early moon, but they could also provide a home to future human explorers. This one on the far side would be a great place to set up a base for future telescopes proposed for observations out into the Universe from the Moon’s far side. The Moon’s surface is a harsh place, the human body doesn’t do well when exposed to the constant radiation present on the Moon’s atmosphere-less environment. Long term human presence would work if astronauts could spend most of their time shielded underground. While excavating a hole large enough to fit an entire moon colony in it would be a huge engineering challenge, these lava tubes could provide ready-made locations for a well-shielded base. Read our previous article about the pit in the Marius Hills. How lava tubes form: when lava flows out onto the surface, it cools on top and may form a solid roof. The roof insulates the still-liquid lava below it, allowing it to continue to flow, sometimes for several kilometers. At the end of the eruption, the lava can drain completely out of the tube, leaving a hollow remnant of the flow that forms an underground cavern. This tube, called Thurston Tube, is about 3 meters in height. So if mare means sea, does this mean that there is a hole at the bottom of the sea? Quick someone get a log and frog! Yass… I like a challenge. My rover would have a deployable compressed gas powered hovering remote *.cam for starters. [Lava tubes] could also provide a home to future human explorers. I’m interested in how stable the structure would be. You wouldn’t want to go living in a hole that might further collapse. Habitat and a very circular dish shaped crater nearby for a radio telescope antenna mount…. Great idea for future settlements and astro facilities. Oh I forgot. We’re not going back. [see previous comments from the doom-mongers].